Lacey Dunn is a 21-year-old full-time dietetics student at the University of Georgia. 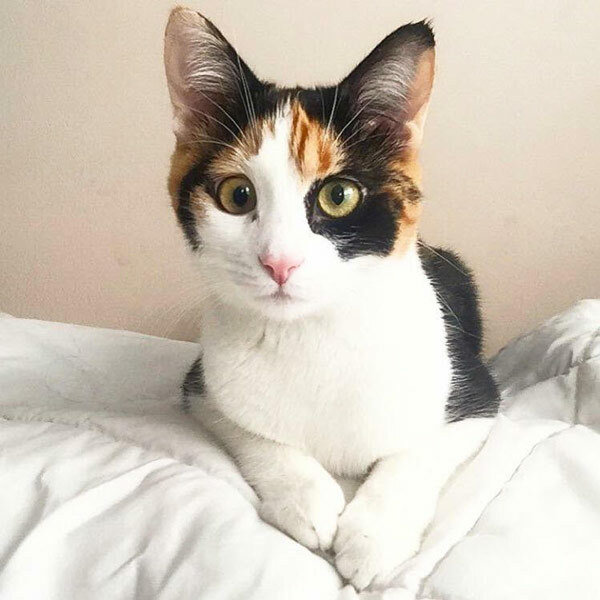 She is also a full-time crazy cat lady and cat momma to a beautiful baby calico named Maple, and has a popular instagram @faithandfit that she updates daily with inspiration, fitness tips and recipes. Lacey grew up cheerleading for a large part of her life, and now competes in the NPC. She is sponsored by PEScience, Bodybuilding.com and Ravish Sands Swimwear. She is studying to become a registered dietitian and hopes to work in the community setting and nutrition counseling to help teach people about proper nutrition, balance and promote self-love. I had a chance to chat with her this past week, and am excited to share this interview where Lacey details her training, diet and inspiration. FitRx: Hi Lacey! I’m so impressed with everything you’ve already accomplished! I started following you on Instagram last year when you did the bodybuilding spokesmodel contest, and found you so inspiring! What was it like to compete in the bodybuilding contest? Lacey: Aw, thank you so much! Wow, that was one of the best experiences of my life! When I made top five, we were flown to LA for both the Finals and photo shoots. We got to meet the crew and family, get to know them, and got an awesome opportunity to shoot with Neveux Studios! The Finals itself was a complete blast. We got to do individual walks and presentation like a pro IFBB competitor would. Then we had to answer questions onstage on the spot and were told to try to showcase who we were and our vision of why we wanted to be their spokesmodel. I was nervous to be onstage in front of the LA Fit Expo, but the inner cheerleader in me loved it, too! I think one of the funniest moments that I will never forget that weekend was when they made us have a dance off onstage and I somehow did a one-legged chicken dance in heels. FitRx: That’s awesome! I really admired that you trained and “prepped” for the contest using your regular workout routine and diet, nothing crazy! What was your workout routine like to get ready for the show? Lacey: For the Finals, I strived to keep my workouts the same, but wanted to up the intensity a bit to lean down a tad for the stage! I did this simply by adding in a short plyo workout (below) on leg days and implementing more supersets and pyramid sets. I stuck to doing two leg days a week, one back and bi’s day, one shoulder/chest/tri’s day and one shoulder day. I created my own workouts by utilizing the BB.com database and plucking ideas from their programs and workouts! I didn’t do any cardio for my prep. FitRx: That sounds really doable as a lifestyle, which is great! What kind of food plan did you use to get ready for stage? Lacey: I have always done flexible dieting. I feel being flexible with your food, implementing ones you love, and having a sustainable nutrition plan is key. I prefer to eat with an 80/20 rule of whole, unprocessed foods. By macro tracking, all I had to do for stage was cut my carbs down a bit to facilitate leaning. I cut them 15g off of my maintenance caloric intake two weeks before the show. An example of foods I like to eat daily include: egg whites, oatmeal, eggs, cereal, rice cakes, chicken, brown rice, lean turkey, vegetables galore, potatoes (my favorite are the red! ), nuts, coconut and oat flour for pancakes, and Popchips— my favorite chips. FitRx: How did you determine your macros? Do you still use this method? Lacey: I did my macros by going into bodybuilding.com and using the Mifflin St Jeor equation at first. I then adjusted for my body! I have always been my own coach up until mid February, when I got the help of Damion from Team The Pro Physiques (formerly AZ pro!). He’s the bomb and I’m beyond excited to see the changes I’ve been able to make at my next show! FitRx: Do you have a favorite healthy recipe that you can share with us? 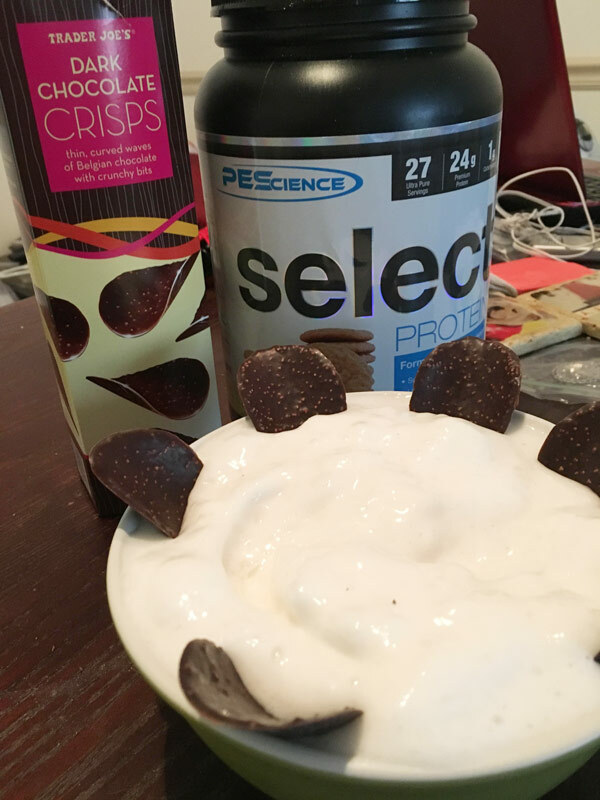 Lacey: I’m not the best at baking, but my favorite post-workout treat is always my PEScience Select Protein ice cream! Mix that in a Ninja (or other blender) and let it blend till the consistency is thick and creamy. Then top it with cereal and crushed up rice cakes! 1.5g Fat/3g Carbs/24g Protein without toppings; with my favorite toppings it is usually 3g Fat/36g Carbs/26g Protein. In this picture, I added Belgian chocolate crisps to it! FitRx: Sounds and LOOKS Yummy! You also compete in the NPC! How long have you been competing? Lacey: I started competing in April 2014 at the Orlando Europa! Since then, I have done a few shows, including Jr. Nationals. My best placing has been at the Tampa Extravaganza in August 2015 where I placed third. FitRx: Congrats! What is your current goal in fitness competitions? When is your next show? Lacey: I really want to show people that competing can be done in a healthy way. You don’t have to go to extremes, and you can still enjoy life doing it! I would love to get a Pro card and continue to prove that. It would be amazing to have one AND be a registered dietitian! My next show will be North Americans in September. FitRx: I’m sure you’ll do great! Good luck in that! You have an awesome social media presence with more than 270K followers on Instagram. What is the main message you try to share? Lacey: I truly want to spread the message of self-love, living positively and want to help encourage people to reach their goals being both happy and healthy! I want to help people realize that they were made unique and beautiful, and to embrace that! Working out and working on their bodies is only part of it. Loving yourself, loving others, and loving what you do- making it a sustainable lifestyle is so important! FitRx: I love how positive and uplifting your feed is! And you have an awesome set of abs! What is one of your favorite ab circuits? I like to do abs two times a week weighted, and one to two times a week unweighted. FitRx: Sounds tough! I’ll have to try that circuit. What would you say is the best advice you have ever been given? Lacey: I was told to always trust in God’s plan for me and to never lose sight of how much He loves me. This advice I got from my Grandma, who is one of the strongest people I know. We are thrown trials and hardships, and can be “tossed in the sea” with our problems, but God will never let us drown. He always has us. The advice to never lose faith, and always know that He is there with me and loves me, is the best advice I have ever gotten and the best advice I can give to anyone. FitRx: Great advice. Do you have a quote or motto that you live by? FitRx: Thanks so much for taking the time to talk with me and FitnessRx for Women! Is there anything else you would like to share? Lacey: I just want to thank you so much for interviewing me and giving me this opportunity! It means the world to me! I just want to say to the readers— don’t ever give up on your dreams. Don’t be the one thing that stops you from reaching them. Have faith in yourself, love yourself no matter what society thinks, and remember to always be you. Take a leap of faith. I sure know I wouldn’t be where I am today without one. Also, I will be doing NASM certification over the summer to start personal training and hope to have some camps started with workouts and nutrition seminars! I will be attending several expos this summer— the Boise Bodybuilding.com Expo, Europa Dallas, Vancouver Pro Show, and hopefully the Olympia! If you have a chance to come, I would love to meet y’all!! Again thank you so much! It was an honor to get to be interviewed by you! FitRx: Thank YOU! Best of luck to you in your competitions, studies and business endeavors!